Once upon a time there was a feature called new navigation. Its goal was to help our most active users find the questions they can answer. "New nav" never made it out of beta and that beta only ever made it to Stack Overflow users. Several months ago we gave new nav a sad, but overdue burial. As we promised, we've been working on a replacement for new nav, and now it's time for us to start rolling it out. 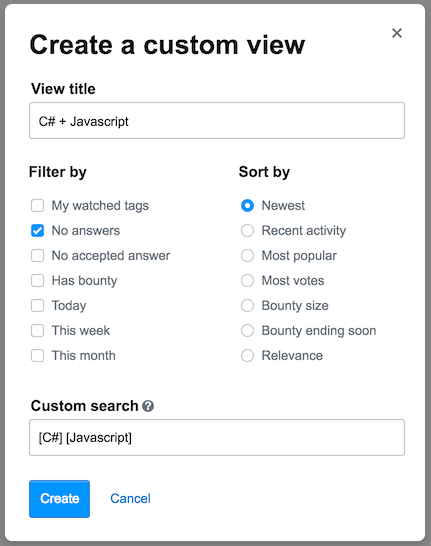 We're calling it custom question lists and we are really excited about its potential to help all users get at the questions that are most interesting to them. While we hope what we've built hits the mark for many of you who have requested a feature like this (e.g., 1, 2, 3, 4, 5, 6), we know how difficult it is to make something complex simple. So, we are rolling this out in beta to gather feedback from you and iterate on it. (Don't worry, we promise to actually release it this time.) When it's live later you'll be able to opt-in to the beta by turning on a new account preference. This will enable the feature for Stack Overflow, Meta Stack Overflow, and Meta Stack Exchange. It will be available for all network sites when the beta period is over. Clarifies the definition of built-in views - Naming is hard and short names can't always describe what a view is showing you. By exposing the filter and sort controls it is more obvious. Introduces the ability to create new custom views - This won't be super useful until we add the ability to save the views to the UI (phase II). Until then you can bookmark the URL and get back to your views. In this phase we will add the ability to save your custom questions lists. In our current design, a dialog will be pre-populated based on the filters and sorts you're currently using. Give it a name, confirm your options, and click save. 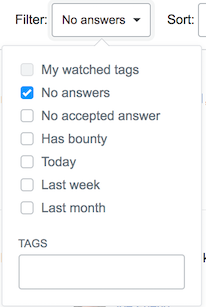 When you save your custom lists they will show up in the "More" drop down for question list views. Additionally, you can add them to the left navigation bar for easy access (see image below). For phase III we'll enable indicators for when new items are available in a custom question list. 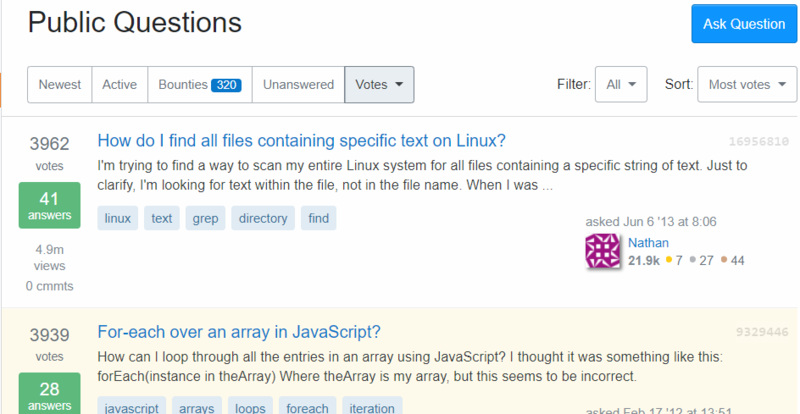 When you pin a question list to the left nav you can see a dot on any list with new items. As usual, we're interested in your constructive feedback. This is a work in progress and, as mentioned, will be rolled out in phases. You can provide feedback on the concepts now based on the information in this post and provide feedback based on the working elements as they are released. If you're open to additional options, there's one filter option that would be a big help for power users on some sites that is not currently implementable via site search: not answered by me. Not infrequently, I go looking in specific tags for questions where my expertise might be helpful. And when I do this, I keep bumping into questions I've already answered, especially on smaller sites. I want to skip those. Could we have that option, or a way to build it? Right now, often enough to be frustrating, I start reading an answer, nod in agreement, try to upvote it, and then notice the problem. Or I see a question, say "ooh I can answer that! ", start mentally composing an answer while reviewing existing answers before posting -- and oops, turns out I've been there already. SO is almost 10 years old; I personally have answers that are more than 7 years old. Relying on memory to filter out those questions isn't working. Please help us more effectively get to questions we should try to answer. As André mentioned, it would be really helpful to be able to see some indication of new activity even when the left nav is collapsed. Something like what is currently done for the review queue, maybe? No freehand red circle, in order to avoid confusion. Sorry folks. For me personally, this might be worth expanding the left nav for (as Joe mentioned). Hooray. I miss the old new nav. One thing I am always confused about: what is the point of "active" and "popular"? 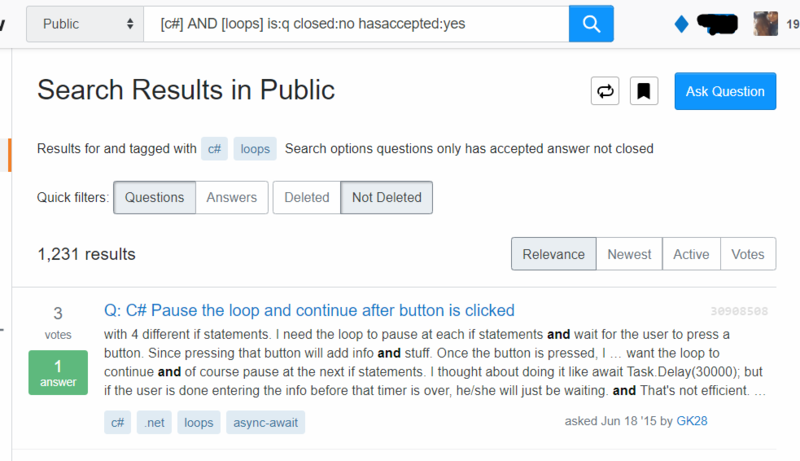 Why do I want to find questions that lots of other people are already answering? Me, I virtually always just want: Show me the most recent questions on my favourite tags (well, one really favourite tag) that have 0 or 1 (non-accepted) answers. So my one big request is: Please allow a way to change the default view. I don't really want to have to always click "More > " and then select something, when that "something" is where I want to be 95% of the time. Please offer an obvious way to clear all filters quickly. But even checking/unchecking all the checkboxes (and manually clearing the "tags" field) is moderately cumbersome, especially if this grows a little further than what's shown in the screenshots in the question. I think that an action link like "Show all questions" or "Clear all filters", immediately accessible no later than immediately after opening the Filter dropdown, would be an awful nice addition that shouldn't take much development or testing time. The red indicator is a bit limited, there is some value in knowing how many new items are in a particular filter. Of course it's difficult, if not impossible to provide exact numbers on a scale like Stack Overflow, but even a limited indicator of quantity would be more useful than a simple binary indicator. If it only displays "none, one, many or too many" it would already be much better than "nothing or one or more". Another thing I noticed with the Teams indicator, which looks the same and I assume is the base for implementing this, is that there is a big difference to me between new questions, and simply new posts or edited posts. Depending on the context, I might only be interested in new questions, and the indicator should allow to distinguish whether there are actual new questions, or just updates or new answers to existing ones. Another very useful feature are the live updates of question lists. 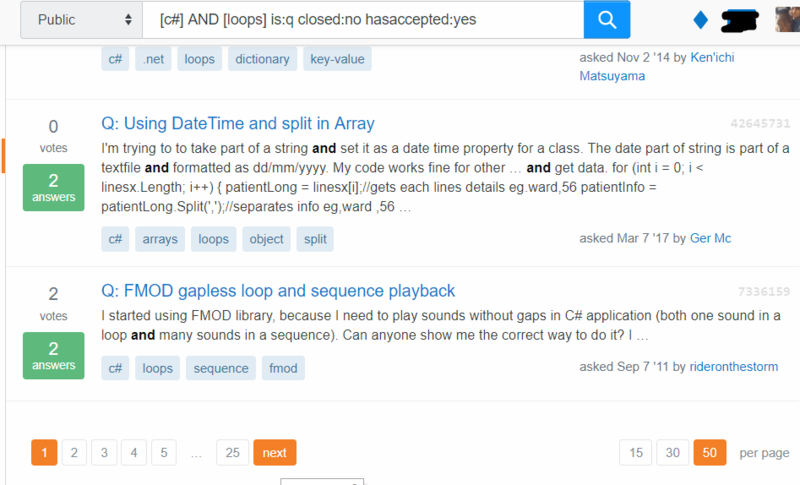 There are some places where they are not implemented like stackexchange.com tag filters, and it's very noticeable. Wearing out the F5 key is really not an acceptable option today, so I hope that those filters will implement live updates just like the tag-specific pages on SO. It's nice to have them on the Left Navi, but do reconsider how they're presented. Now they're under "Shortcuts" and with smaller font than the quite useless Users etc links. That's bad usability. I would say that these links will be used the most so they should be prominently presented, at the top. What I've seen here in comments of the Left Navi most people don't have any use for the links that currently exist there. So they should be lower than the lists we create. So please let us see the things we create ourselves first. We create them for a reason so they should be there nice and easy to use. The things you decide we must have there can be lower. Please don't limit the customizable options to just those you've outlined in the screenshot. I personally am looking for all possible options configurable in a custom view. There is another feature that could be extremely helpful: being able to hide a given question from the custom questions list. If I see that I definitely won't be able to answer a given question, it would be nice to be able to hide it from the view, so that I could focus on others where I might have a good answer. In the UI this could be solved by adding a "hide" button next to every question, when using the custom questions list. This doesn't feel very useful to me. It requires me to set up a custom configuration, and the options I can configure are pretty limited. What I want is the site to help me find questions that I am likely to be interested in, and likely to be able to answer. I would much prefer something that analyzes the questions I have answered and the questions I have voted on and the attributes of each new question (number of votes it has gotten, number of answers, relationship to questions I've answered and voted on), and then suggests questions to me. I don't want to have to configure it all by myself -- I'd like the site to help me with it. This might be just me. 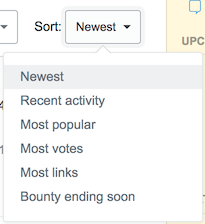 Why are bounties hidden behind a "More" drop down? More importantly, are these always hidden, or are there different views for different groups of users, like currently exists? 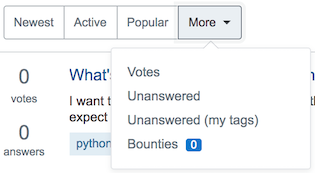 The bountied question will appear with a special indicator in all question lists, and it will also be visible on the homepage Featured tab for 7 days. Part of what you’re “paying for” with the bounty is to get additional attention for your question, over and beyond what a normal question gets. It seem to me that both the current implementation (linked above) and this proposed implementation is not providing that additional attention. It's hiding "Featured" questions behind a drop down that (admit it) a small minority of users will end up using. Both of the images above make it clear that there are bountied questions available. It is easy to spot and it provides a quick glance to followers of a tag whether or not there are bounties for this tag. Are there any featured items here? I don't see any. 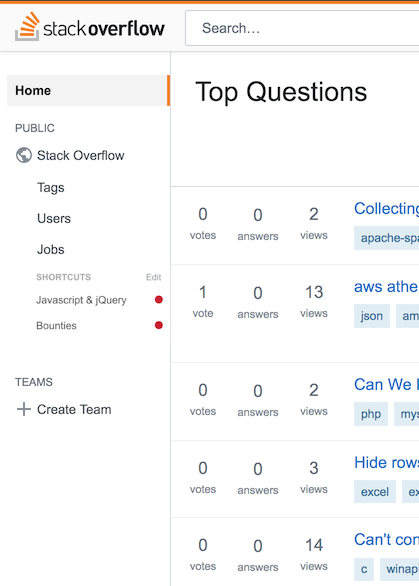 Will these list views of questions live update like the current default questions view? One of my biggest gripes with the new-nav when it was available was that I had to refresh to see whether there were any new questions. The notification on the left sidebar is helpful but it breaks my focus having to look out of the list view over to a separate part of the page, register what it means, and then click it again. It's also unclear whether the red notification on the sidebar will be live-updating or only on a per-pageload basis. E.g. if I am sitting in the review queues, and someone posts a new question for my filtered/custom list, will that red light blink on immediately? Or will it blink on only on pageload the next time I load a page? While you wait for this to roll out you can create your own Filtered Question List or use the main site's Live List to see what's happening in real time and what's hot system-wide. Switching tabs when filtered on the intersection of two tags (tag1tag2) expands it to the union of two tags (tag1 or tag2). Possibly related bug on MSO here, that's how I discovered this. 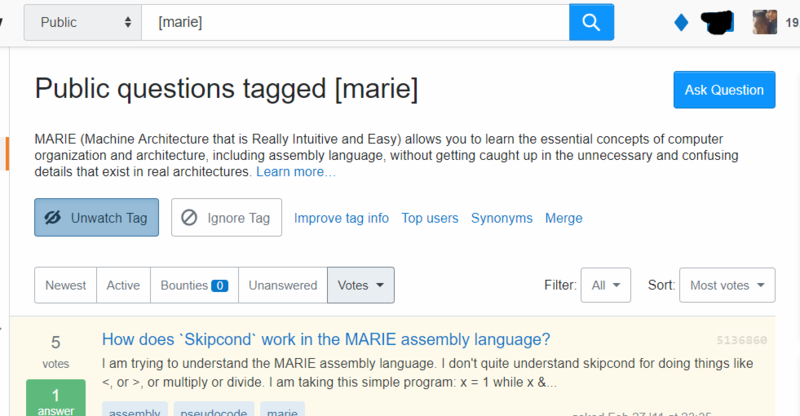 When doing a simple search on a tag (by clicking on the tag or using the new search box parameters), the pagination is not working. I've tested this on tags with more questions. When I click next it clears the search and takes me to the home screen. When I use the new search function and even put in some more complex parameters, it's working.